What Is the Difference between a Dog Farm and a Hog Farm? If you ever have attended a western-style barbecue you will most certainly have seen a pig being roasted over a fire. And if you have traveled through some parts of Asia you might have come across a dog on a spike being roasted over a fire pit. If you go shopping through almost any super market in the western hemisphere you will come across rows and rows of products made from animals such as pigs, cows, sheep, chickens, turkeys, and maybe some rabbits, too. They will hardly ever still be recognizable as coming from any of these beings, because how would you cook a whole cow? Even a rabbit still wearing her fur coat seems to be unappealing to the appetite of someone who would most happily chew on a part of her. There also might be different varieties of animals from the sea, some fish will be lying on ice, others have been cut into smaller pieces so that you no longer know who was chopped up into easily cookable portions. And you might see tanks with live animals like lobsters and other sea creatures. In many Asian markets and food stores, you will see a different variety of foods, including different animals displayed either in bits and pieces or as a whole for human consumption. If you have ever walked over a farmer’s market in different parts of the world you will certainly have come across whole chickens hanging – either still alive or having been killed recently – from wooden beams. There will be goats and sheep cut open, their intestines removed, but otherwise still easily recognizable as the animals that would have walked to the market with the farmer. There will be cages with chickens, birds, and, depending where in the world you are, maybe with monkeys, maybe with dogs. More and more stories have come up recently showing us pictures of dog farms in Korea. And of these farms being raided by animal rights organizations, taking the dogs and rescuing them from being slaughtered for human consumption. What would a farmer in Iowa, North Carolina, Germany, China, or Russia say, if a group of people would rescue their pigs and cows from the slaughterhouse? If this group of people would say that the way they have been treating these animals in their care is inhumane and therefore these beings need to be rescued? If these people would say that it is inhumane to eat such a being because it is a sentient being? Humane education is one of the most important parts in raising awareness, in leading a path away from inhumane traditions, in bringing insight into the plight of millions of animals. Pointing with fingers at those who do something differently will probably not lead to a change of thinking. But giving someone the possibility to look at the picture from another angle, and giving someone the chance to decide on their own how to change their ways will most likely lead to a willful readiness in change. And this will not only save those sentient beings stuck in that cage in this moment but to less cages in the future. Petition: Is Killing Animals Part of Yoga? 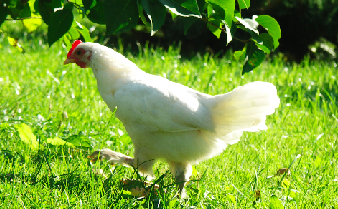 Contrary to yoga’s central tenet of ahimsa (“do no harm”), the Be Well Studios yoga center in North Conway, New Hampshire, is offering a chicken-killing workshop at 10 a.m. this Saturday, June 28, at Mountain Flower Farm, which is operated by The Local Grocer. Please join us in urging the owners of Be Well Studios and The Local Grocer to cancel the event and to pledge never to teach violence to yoga students. Chickens feel pain and fear just as the animals who share our homes do, and they deserve just as much consideration. These intelligent birds form strong family units, and mother hens even cluck to their unborn chicks in their eggs. Slitting a chicken’s throat causes him or her to experience pain and terror while slowly bleeding to death.